It seems like there is a lot of prep needed for a ski trip. You might feel overwhelmed if this is your first time. 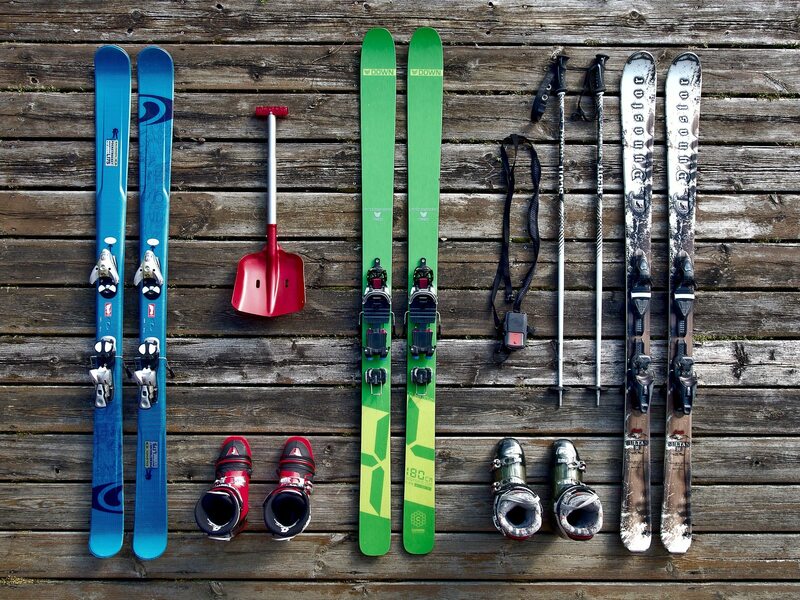 We’ve put together a quick gear list and highlighted what to look for when buying and packing for a ski holiday. Of course, if you want more advice, call into Great Outdoors on Chatham street and talk to our ski experts. 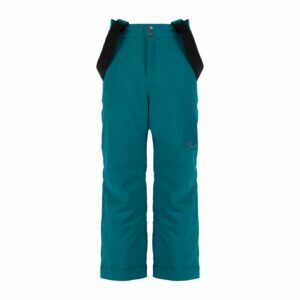 When buying new Ski Pants, you want something that is easy to move in, is weatherproof and breathable, has elasticated cuffs so snow won’t get in, articulated knees for freedom of movement. 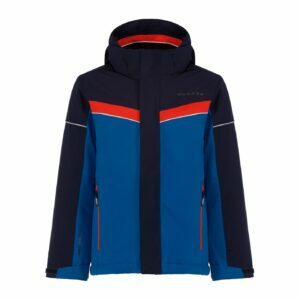 In terms of Ski Jackets you should look for pieces with good stretch, that are not only waterproof but also breathable. 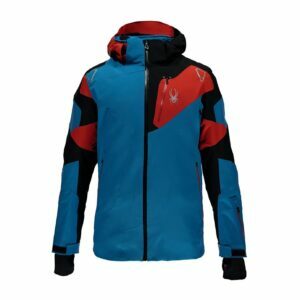 Bonus points for jackets with built in Recco search and rescue technology, large zip up pockets for your ski pass is an added bonus, look for jackets with with fleece panels or extra lining around your core. In terms of socks– not just any will do when skiing. Cotton socks will soak up any sweat and moisture and leave your toes freezing. Look for socks that have extra padding– especially on the shins for added shock absorption. We also recommend picking up a Buff are incredibly handy things- use them as a face protector, neck warmer, hair band…the list is endless. Your face will feel the cold and wind the most and some skiers like to wear a Balaclava under their helmet or a Neoprene face mask which will retain heat even when wet. To protect against the sun and wind, you should pack an SPF and lip balm – don’t forget under your chin as the snow reflects the sun back up at you. 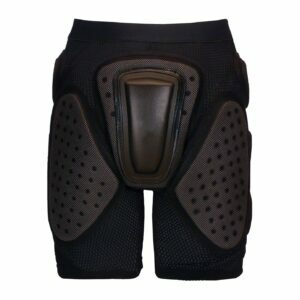 You can not under estimate the power of a good base layer. 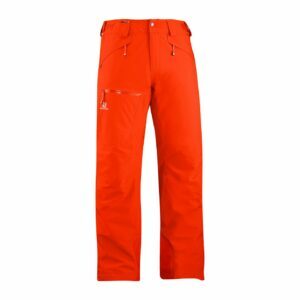 Wear the Helly Hansen Warm Pants under your ski pants, if they’re good enough for the US Alpine team, they’ll be good enough for you. The Oasis Icebreaker Crew top is great for active wear and will keep you at just the right temperature. Invest in a decent pair of gloves for both on and off the slopes. 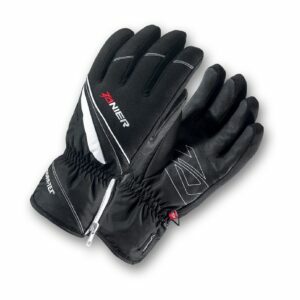 Look for gloves with great grip, GORE-TEX® to keep you warm and dry, padding on thumb and index finger, zip pockets and lens wipers. 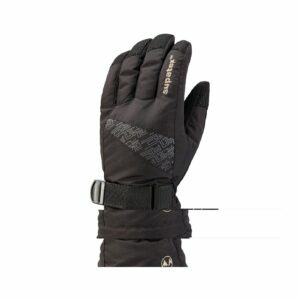 We recommend the Zanier Womens Zell GTX, the Zanier Mens Rauris Gore-Tex Gloves and the Manbi Kids Motion Glove. If you want to go all out we have very special gloves by Zanier with rechargeable batteries that give up to 10 hours heat. 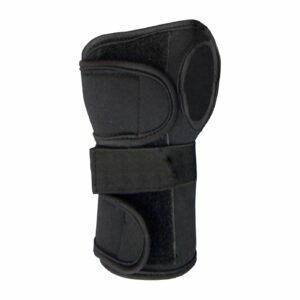 Glove Liners will add an lightweight extra layer of protection. Look for merino wool with natural thermal qualities like the Icebreaker Oasis Liner or the Seal Skinz Fingerless Merino Liner which are great if you think you’ll be taking your gloves off while taking photos. There is nothing is more annoying than losing a glove and you don’t want this to happen when you’re on the slopes. 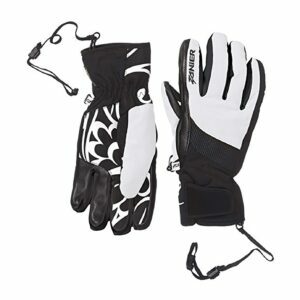 Glove leads can be threaded through the sleeves of your ski jacket and your glove can dangle safely when you need to go hands free. The Manbi Glove Glue leads are a good option-and are especially good for kids. It is always worth having a few Hand or Toe Warmers in your pocket to give you an extra blast of warmth while out on the slopes. We cannot forget about safety when skiing. 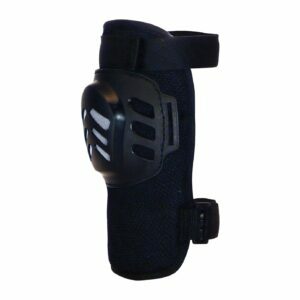 Manbi have a crash pant, helmet and great protectors for your knees and wrists. When choosing a ski helmet, you want one that fits well and comfortably. The Salomon Custom Air helmets have clever air release pads that allow you to get the perfect fitting helmet. Other features to look out for are adjustable ventilation panels, clasps and grooves to help keep your googles sitting just right. Goggles are a skiing essential. They will protect your eyes from the glare of the sun which is especially powerful at altitude, help you see the horizon better and will protect you from cold wind, snow and branches as you are travelling at speed. 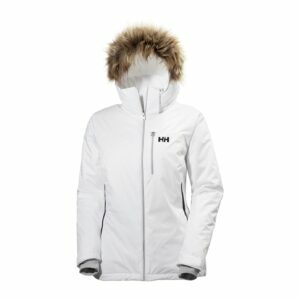 Lenses have different categories and the higher up you are skiing, the higher lens category you will need. Goggles with a change of lens are a good investment and you’ll be ready for the slopes no matter what the weather conditions. Double lenses help prevent goggles from fogging up- luckily for you, all the ski googles in Great Outdoors at the moment are double lenses. Don’t forget to store your goggles in its pouch-even when it is in your pocket this will protect it from grease and the zip. 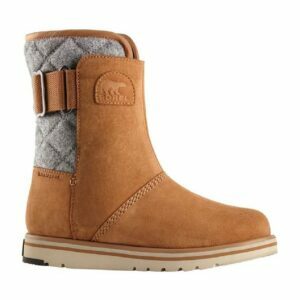 Don’t forget some warm shoes with a good grip for when you’re hanging out après–ski such as Sorel or Olang boots. We are especially impressed with the OC Kiev boot which has a special ice grip in the sole which you can flip out as required. 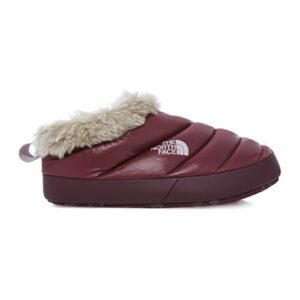 You can’t beat relaxing in a cosy pair of cabin socks or a great pair of The North Face Womens Nuptse Tent Mules. You’ll need a good beanie or earmuffs too.